I heart sushi. Love it. Not the raw stuff, however. I like the Americanized-cooked stuff. Imitation crab, battered and fried shrimp, smooshed together with vegetables, wrapped in seaweed and sticky rice and dunked in soy sauce. The problem is the cost. Even at KoFusion’s dollar sushi deals, I can rack it up. In fact, I believe I would be competitive in a sushi eating contest. For this reason, when Moki Sushi Japanese Cuisine came to town, the words “all you can eat” really resonated with me. Moki Sushi, at 2017 South Neil Street in Champaign, next door to Champaign Outdoors and Rugged Outdoors welcomes casual attire. I would not bring kids here unless sushi is their thing; there is no menu for little ones. I won’t lie — our experience started out rough. We stood around the entrance area for 10 minutes while angry and confused people huddled. Everyone was either trying to get someone’s attention, butting in front of us in line or yelling to passing servers that they had a reservation. It was frustrating, and it put me in a mood. Finally, we assertively saddled up to the bar. One bar is where the sushi is frantically being made, and the other bar had a woman sitting among a bunch of drinks. We asked a worker to clear it off, and we sat there. This is where the tide turned. The manager turned out to be our server. He was very attentive, very kind and very informative. We were given slips of paper listing the appetizers, salad/soup, nigiri (a slice of raw fish over pressed vinegary rice), vegetable/regular/signature rolls. You mark what you want, and you give it back to the server. They also have booze and other drinks, including Japanese favorites. There is all-you-can-eat option, but here’s the catch: You must finish all of your order! This includes the rice. You will be charged for any leftovers. We chose the edamame, fried gyoza and fried shumai (potsticker-dumplings, you can get fried or steamed), angel hair roll, California roll, crazy kani roll, Godzilla roll and the Tiffani roll. There are typically eight pieces per roll. After we ordered, we started to panic. Did we order too much? Halfway into the meal, I was still anxious about finishing. They bring the food out as it’s ready, so we had about three rounds. I settled down when the last two rounds were delivered. At this point, I knew I could conquer these rolls. It became a challenge. Next time, we will know exactly what we can handle, and I think I could go for one more roll. The manager specifically recommended the angel hair roll. It’s their most popular item. It had apple, avocado, shrimp tempura (fried shrimp), topped with crab, crunchy fried bits, eel sauce, masago (processed fish eggs), scallions and spicy mayonnaise. AMAZING. This was my favorite roll. My second favorite was the dynamite roll. It had avocado, cream cheese, spicy tuna tempura, topped with eel sauce and spicy mayonnaise. So, let’s say we ordered off the menu, and we didn’t order from the all-you-can-eat option, our bill would have been about $86. All you can eat was about $50. You can order off the menu, too. 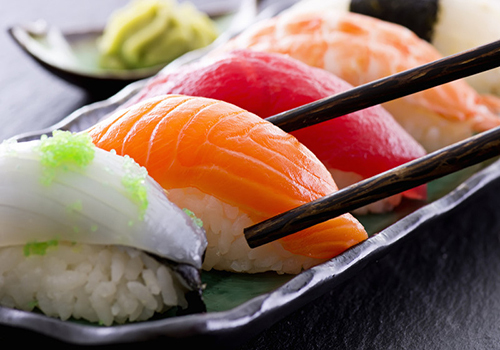 There are main dishes, a variety of rolls (many pieces of the same sushi), sashimi (raw fish), sushi (seafood with rice) and combos for a set price. Try the chicken teriyaki or shrimp tempura. The main dishes are served with green salad or miso soup, mixed vegetables and steamed rice. You can order online, too. Or preorder sushi party trays. I woke up with some bad heartburn, by the way. I may pop some Tums the next time. And there will be a next time.